ILL BILL & Stu Bangas - Cannibal Hulk. Vinyl LP. Bleep. A pair of East Coast hard-heads unite on Cannibal Hulk. MC Ill Bill and producer Stu Bangas have been knocking out bars and beats for so long that it’s safe to say that we’re in good hands here. 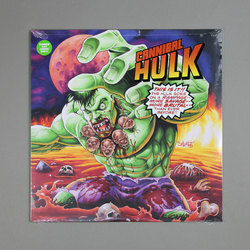 On new joint Cannibal Hulk the pair present a selection of grizzled hip-hop tracks that shade in influences from horrorcore, boom-bap and old-school gangsta rap. Vinnie Paz, DJ Eclipse and Goretex are among the guests.